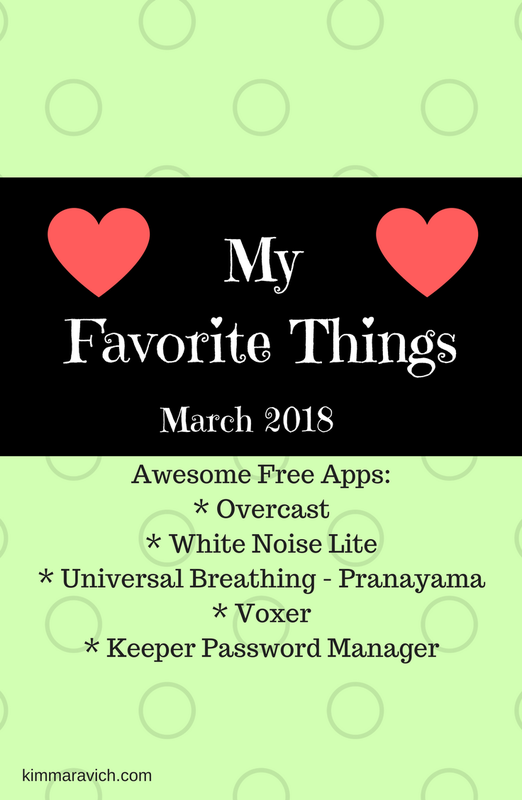 This month's favorite things is dedicated to some of the apps I love ... all of which are FREE. I'm on my iPhone on any given day waaaaay more than I'd like to admit. It's crazy how often I pick the device up ... to check the weather, look at Facebook or Instagram, Google a question I have, play Words with Friends, or watch an occasional YouTube video or Netflix show. Even though there are a myriad of mindless ways to lose oneself in a smartphone, there are actually some very cool apps out there ... ones that are pretty useful. This is an app for playing podcasts that I've recently discovered. You know how much I LOVE listening to podcasts, and being interviewed on some has been a true privilege (check them out here). I listen to podcasts at any chance I get ... driving in the car ( I pop my ear buds in while the kids are watching a DVD in the back seat), while showering or getting ready, or on the rare chance I get to go on a long walk. In the past, I religiously used Apple's podcast app, but after some recent updates, that app is so glitchy and became frustrating to use. Enter Overcast. This app plays podcasts much better and has features like Smart Speed, Voice Boost, and Smarter Playlists. You can create custom playlists, set a sleep timer, automatically download episodes to which you subscribe, and adjust playback speed. There are also ways to connect to the Apple watch. The app is free, but you can upgrade to a Premium version. If you've never listened to a podcast before, definitely give it a try. There are so many genres from which to choose ... health, self-help, comedy, educational, political, gaming, music, news, sports, technology ... you name it! Since my sons were born, I cannot sleep without some sort of white noise. It began with hearing white noise over the baby monitor. Each boy has a sound machine in his room that has a soft-glow nightlight and plays white noise (or various other sounds like ocean waves, rain, soothing music, etc.). I became accustomed to hearing this sound each night, and now, if I try to sleep without it, I just can't! This becomes problematic, for me and the boys, when we travel and don't have the machines. There is scientific research to prove that white noise is helpful. Even when we're asleep, our brains are constantly scanning and listening for sounds. White noise masks sounds so that your sleep is not interrupted. The app "White Noise Lite" plays sounds like an air conditioner, beach waves, blowing wind, dishwasher rinsing, hair dryer blowing, rain, stream water, vacuum cleaner, frogs croaking, grandfather clock, or plain old white noise. The app also has custom settings for a digital clock with brightness control, alarm and timer system, swipe volume controls, AirPlay, and much more. Staying with the relaxation theme, this app is both soothing and meditative. If you've taken a yoga class, you've likely heard of pranayama breathing. Pranayama is the formal practice of controlling the breath, which is the source of "prana", or vital life force. It is a yogic breathing exercise which is said to quickly increase energy, release stress, improve mental clarity, and boost physical health. This app was created by doctors to reduce stress and stress-related illness. The app allows you to focus on mindful breathing techniques. It's said to help you fall asleep faster, boost athletic endurance, manage asthma, decrease blood pressure, relieve headaches, lessen stress, and improve moods. This app is so simple yet very effective. Essentially, you watch a little avatar of a yogi seated in a lotus position (sort of like a pretzel) breathing in and out. Beside him is a circle which lights up different areas indicating when to inhale, retain the breath, and exhale. You can select how many breaths to take per minute. (There are only three possible selections.) I choose the 5.2 breaths per minute because anything less than that makes me feel like my lungs would explode. To a trained yogi or maybe a great underwater swimmer, holding your breath for longer periods of time might work, but that's not relaxing for me. You can also select the kind of music you want to play. I like something called "vedic" style. These are just tones that change frequency with each inhalation, retention, and exhalation such that you could close your eyes and be guided when to breath and not be required to watch the circle. I really do find that this helps relax my breathing, calms my nerves, and is also really meditative. I'm not good at meditating in general because my mind always races, but this app forces you to slow down and concentrate. I personally like watching the avatar and the breathing circle because it takes my mind off of everything and anything else. I emerge on the other of seven minutes truly feeling much more relaxed. There are versions of this app to which you can upgrade for a fee, and they may be even cooler, but the free version works for me. Voxer is really new to me, but it was created over 10 years ago. This app combines the best of voice, text, photo, and video with walkie talkie messaging. The app creators claim it's better than phone calls and faster than texting. Just push a button, talk and instantly communicate in real-time, live. You can also listen to saved messages later at your convenience, share text, photos, video, and your location. A fellow author friend of mine suggested I download the app so we could leave each other voice messages instead of emailing so much. This is truly perfect for a mom like me who has little ones in the house. I CANNOT ever talk on the phone. In fact, when people call me, it stresses me out. My boys either start attacking one another, or they just won't leave me alone for two seconds and are pulling at my pant legs, yelling at me to "get off!" Emailing and texting are great, but it's super duper quick to just orally spout out a few sentences into your phone. You literally press the virtual button, hold it down while you talk, and let it go. Presto! Message sent. And even better, the person on the other end can listen to it whenever they want. It's even better than leaving a voice mail because the other person's phone doesn't ring, you don't have to cross your fingers hoping they don't pick up ... which would lead to the dreaded phone conversation ... AND they can respond in their own time, too! Do you have difficulty remembering 100 different passwords for 100 different websites? This app is the answer to your problems! When you're required to have passwords for online stores, health care websites, subscription services, credit card information, social media sites, and everything in between, it can be really baffling to remember them all. And it's NOT safe to write down passwords in a notebook or on a post-it taped to your computer. You never know who could get their hands on them. Having all your passwords in one place is really helpful, and you can be assured they are secure with this app. Keeper locks your private documents, files, and photos in a secure encrypted vault, so you won't get hacked. Some of the features of the app include unlimited passwords, auto-fill passwords, passwords that are accessed and synced from any of your devices, ability to safely store credit and debit card information, folders for password organization, compatibility with Apple watch, and integrated two-step verification providers (like SMS or Google) in case someone would try to access your app. To open the app, you must have ONE primary password. Once you type in that one password, you have access to all of your other passwords, folders, and information. So, instead of remembering 100 passwords, you just have to remember one. This app has made searching for passwords much easier for me, and each time I'm required to create a password for something, I immediately also enter it into my phone. That way it's always there should I need it again. I even have private information in my app, like my children's social security numbers, my husband's clothing and shoe sizes, addresses and birthdays of loved ones, doctors' appointment histories and dates, etc. Keeper is perfect for storing all that information that I used to write down in a thick notebook. This takes up no space at all! I will admit that I've upgraded to a paid version of this app, but you certainly don't need to. Thanks for reading March's list of "My Favorite Things." Drop me a line and let me know about your favorite apps! I'm always looking for new technology to make my life simpler or more enjoyable!